This month we travel to Belfast, to consider the implications of Brexit for Northern Ireland, the Republic of Ireland, and the United Kingdom. 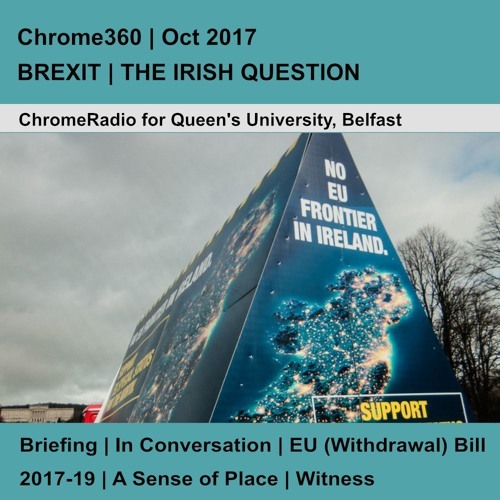 BREXIT - THE IRISH QUESTION is produced in collaboration with QUEEN'S UNIVERSITY, BELFAST. At the EU Council on 19-20 October, EU leaders are due to decide whether to move to trade talks, the next phase of the Brexit negotiations. For this to happen, there must have been satisfactory progress on the so-called separation issues – the Brexit bill, the rights of EU citizens post-Brexit, and the Northern Irish border. The signs are not hopeful. But both the EU and the UK agree that the challenges raised by Brexit for the island of Ireland are unique and will require a bespoke solution. BRIEFING | PROFESSOR DAVID PHINNEMORE David Phinnemore, Professor of European Politics, outlines the particular challenges Brexit presents for Northern Ireland, and thoughts on areas to explore in terms of possible solutions. IN CONVERSATION | PROFESSORS COLIN HARVEY & LEE McGOWAN Professors Colin Harvey and Lee McGowan discuss the implications of Brexit for the Good Friday Agreement, the Common Travel Area, and the future of Northern Ireland as well as of the United Kingdom as a whole. EXPLAINER | EU (WITHDRAWAL) BILL 2017-19 | PROFESSOR COLIN HARVEY Colin Harvey, Professor of Human Rights Law, on the European Union (Withdrawal) Bill 2017-19, and the key concerns the Bill raises as currently drafted. A SENSE OF PLACE | PROFESSOR GLENN PATTERSON Professor Glenn Patterson, writer and Director of the Seamus Heaney Centre, heads south for the border. He visits Omeath and Newry to find out how those living along the border see the future post-Brexit. WITNESS | DR KATY HAYWARD & DOMINIK HAMM Dr Katy Hayward moved to Northern Ireland in 1995. She reflects on the changes she has witnessed, and the impact of Brexit. German postgraduate student Dominik Hamm arrived in Belfast in autumn 2016, shortly after the EU referendum. He talks about what Brexit could mean for him.